Cherys smaller passenger vehicles will continue to use Chery as the brand name. GUANGZHOU -- Chery Automobile plans to divide its growing product line into four sub-brands with different badges, said company spokesman Jin Yibo. Cherys product lineup includes nine passenger vehicles, one commercial vehicle and one minivan. To date, all its vehicles are sold under the Chery brand and carry the same badge. In April this year, Chery will start implementing a multibrand strategy, Jin said. The passenger vehicles will be further divided into the mass-market and premium types. Thus, Chery will operate four sub-brands in the future, for premium passenger vehicles, lower-end volume passenger vehicles, commercial vehicles and mini vehicles, respectively. The premium brand is mainly for large sedans while the commercial vehicle brand is for vans and small buses with more than seven seats, and the mini vehicle brand is mainly for minivans, Jin adds. He said Cherys smaller passenger vehicles will continue to use Chery as its brand name; its commercial vehicles will carry a new brand, Karry. Its premium cars and mini vehicles will have new brand names, which will be unveiled later. We need multiple brands to tap different market segments since the number of our models has increased quickly, Jin says. Chery plans to launch 15 new and redesigned models in 2009. Jin adds that each of the four sub-brands will have several new cars to debut. But he declined to give further details. We will debut 19 new cars in Shanghai auto show in April, many of which will be launched into sales soon, Jin said. 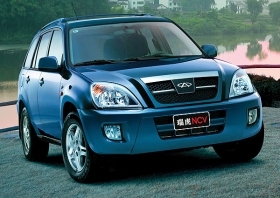 Jin also said Chery sold 356,000 units in 2008, of which about 135,000 units were exported. He adds the company targets to sell 260,000 cars in China and export 150,000 units this year. The global economic crisis posed big challenges to Cherys exports, Jin said without providing more detail.